The new year has brought many changes. I am not self-employed any more and I am now working full time as a Senior Visual Designer Sourcebits. So, now making custom toys and my own sculptures has become a hobby once more. Despite having a lot less time to invest in this area it has also freed me from the need to put out anything for the pure sake of surviving. What you see above is my most recent creation. I usually have a tendency to go overboard with details and it was a nice change to try to reduce an already heavily textured toy to minimalistic doll-like features while still keeping the original proportions. Alien Argus Adelheid has a little backstory: Despite her eyeless face Adelheid was born gifted. Since her birth she seemed aware of more than any other human around her. Her parents named her Adelheid because despite her upsetting looks, she was of very gentle and noble nature. Everyone else called her “Alien Argus” because once you had met her you left with the impression that she had seen everything. Your past and your future, your very being. Adelheid met an early and unfortunate end when she was lynched by scared group of villagers blaming her for the death of the mayor’s child which she had predicted earlier. Her parents never had any children thereafter. Customized version of Mark Nagata‘s Alien Argus toy. 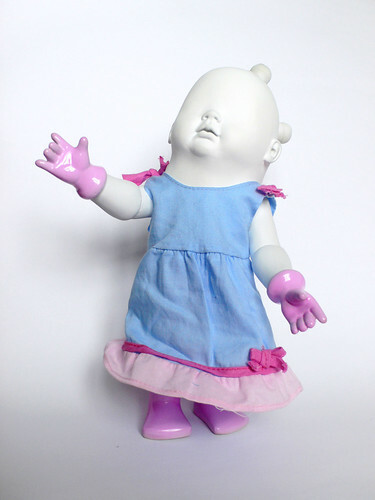 Made from soft vinyl doll parts, Apoxie Sculpt, acrylics and fabric (the doll’s original dress) and internal impact activated color-changing LED. Stands ca. 27cm tall. Available for purchase at the upcoming “Alien Argus Custom Show” at LA’s Toy Art Gallery.